One of the stalwarts of Sheffield Food Festival, we hear from show stopping stallholders and award winning company The Chilli Alchemist about their journeys in SPICE! Chilli seems to be everywhere these days. You can find it in sauces, crisps, jerky, mayonnaise, ice cream, jams, sausage and much more. However, it never used to be that way. Go back as few as five years ago and you won’t have found it to be so prevalent. Most supermarket shelves carried a few token chilli sauces such as Tabasco, Encona or sweet chilli sauce and you might have found a few red chillies in the fresh produce aisle but that was pretty much it. The UK was unknowingly shrouded from chilli and only a few specialist companies offered a wider range of products. It was during this time we set up The Chilli Alchemist. Being well travelled and exposed to other countries’ ingrained cultural use of chillies, we were always amazed at the variety and flavour variations out there. The South Americans have been using chillies for thousands of years. They even used them as tax payments to Aztec Emperors! In more modern times, they use them well in popular dishes and make some fantastic condiments with a very high chilli content. Once we had tried sauces like this, we realised that the UK was missing out. Being keen growers of chillies, we were initially able to produce enough crop to make sauces that celebrated the fiery fruit. We were determined to make chilli the star of the show in each bottle and spent time studying varieties and ensuring we were selective. 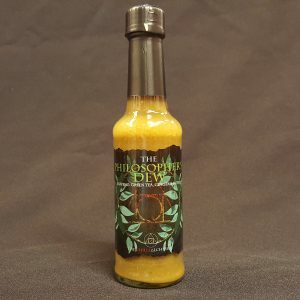 It’s arguably easy to make a sauce, drop in almost any type of chilli and call it a ‘hot sauce’ however, we don’t make hot sauce, we make chilli sauce – there is a big difference! On average, our sauces carry around 40% fresh chilli along with a few supporting ingredients. Each sauce we make is built around the individual flavour of the chillies we like and select. For example, we produce a condiment we call The Philosopher’s Dew. It has 50% fresh green jalapeno chilli in it. As this pepper is a little bitter and earthy, we compliment it with fresh ginger, Matcha green tea and garlic. For balance, we add a touch of honey. The dominant flavour is jalapeno and the supporting ingredients are a pleasant back note. We’ve been making this sauce since our beginning and, admittedly, it was a tough cookie to sell to begin with. People were unsure of Matcha green tea or uncertain about a naturally green sauce. It wasn’t what they were used to. It wasn’t sweet nor acidic. It wasn’t of thin viscosity nor a smooth ketchup style sauce. However, we stuck to our guns. We were convinced that this style of sauce, along with our others, would find its place in the UK. Fish and chips was no longer the nation’s favourite dish and tikka masala had taken over. The UK’s taste for spice was awakening and we wanted to provide something new and interesting to the blossoming foodie. Today, The Philosopher’s Dew is one of our most popular sauces. It’s medium/hot and delicious with lamb, hummus, noodles and salads. 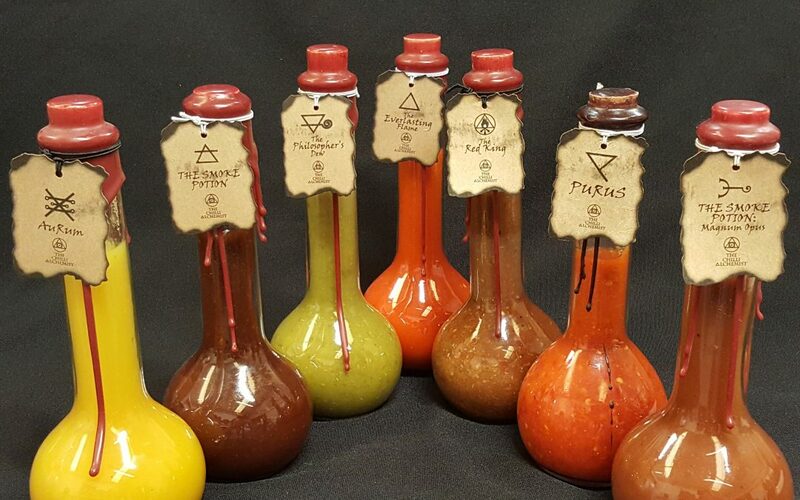 Believing that the market for chilli sauces would grow and that competitors may arise, we also wanted to offer our products in a unique fashion. Therefore, we bottle each sauce in two ways. One is by using the standard 148ml/5oz ‘Worcester Sauce’ style bottle and the other is in our ‘apothecary’ bottles. These are specially imported bulbous bottles which have a long neck. We cork seal each bottle and then dip them in wax, quickly turning them upright so that the wax runs down the neck. 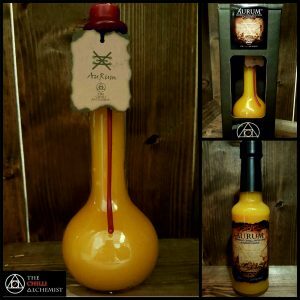 It creates a superb potion-like look and makes a great gift. Each apothecary bottle is then boxed and easy to wrap! We have a theory that everyone knows someone who likes chilli, even if it’s not themselves. Five years in and we have grown from hobbyists to a company that now has its own production kitchen and unit along with full & part time staff. It’s testament to hard work and the UK’s growing love of chilli. However, there is still the odd hurdle to overcome and the main one is when us Brits like to try or eat chilli. Whilst other countries will regularly eat it any time of the day, it would seem that here in the UK we don’t like to touch it until after lunch. We’re not quite sure why. Here at The Chilli Alchemist we genuinely eat it for breakfast. In fact, most of our sauces are made early in the day so it’s not uncommon for us to be tasting chillies at 8am. It’s a perk of the job! All we need now is for more people to embrace it as an ‘anytime’ food. It can certainly help wake you up in the morning!